In Southwest London, the iconic Kew Gardens houses the world’s most diverse collection of living plants – numbering about 30,000. The Herbarium at Kew Gardens contains about 7 million preserved plants. The on-site library contains about 750,000 volumes dedicated to plant studies. In 2003, Kew Gardens was named a World Heritage Site by UNESCO. The Palm House is one of three major buildings on the grounds. It is a breathtaking glass structure made of wrought iron and glass. The building houses the Garden’s collection of palms. A second structure, twice the size of the Palm House, known as the Temperate House, is the largest glasshouse in the world. The third major structure in the Kew Gardens is the Princess of Wales Conservatory, which was opened in 1987. It houses plants from the dry and wet tropics. Kew, which is an area that has been absorbed by London, has been the site of a royal residence since about 1300. The Kew Gardens were originally created in the late 1700’s by combining several royal residences. At that time, the Garden’s first curator was also appointed. The Gardens became a national botanical garden in 1840, shortly before the Palm House was built. The Palm House was constructed between 1844-1848 of wrought iron and glass. It is the largest surviving Victorian-era iron-and-glass structure in the world. The glass panes in the Palm House are all hand-blown. The original glass in the Palm House was tinted green to reduce the heat buildup in the building. 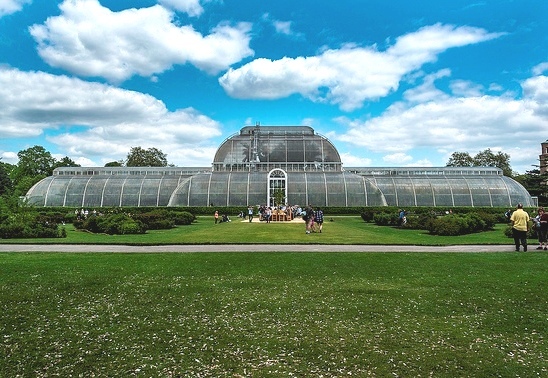 The Kew Gardens is one of London’s top tourist attractions. Annually, it welcomes more than 1.3 million visitors, and occupies about 300 acres. Glassprimer™ glass paint is a specialty glass coating product designed to bond permanently to glass. Glassprimer™ is low-odor, and comes in both oil- and water-based forms. If you’re looking for some glass inspiration, please visit the rest of our site. If you’d like to purchase Glassprimer™ glass paint, please visit our online store .